The magical world of ‘Harry Potter’ captivated a generation and rocketed author J.K. Rowling to international fame. With the success of her seven-part book series, there was little doubt that this amazing story would be adapted to the big screen. But there were many questions about how to do it and who should be involved. With millions of fans anxiously awaiting the release, there was little room for error. J.K. Rowling (author): It was part of my book deal that everything I published was to be stored overnight in the belly of a stray dog that had been dead for three or more days. As an artist, I’ve always felt very strongly about this. Tanya Seghatchian (executive producer): Once we were able to read the manuscript without vomiting, we saw that the book was truly terrible. David Heyman: It was, by all accounts, a hellish book. Her story was about a talking turtle named Grondunglin who convinces his entire family to swim into an underwater thermal vent, killing them all. I said, “What if we make it about preteen wizards?” and we were off to the races. Alan Rickman (Severus Snape): During my audition, I looked the producers right in the eye and said, “I want to play a character who has long hair like Kurt Cobain.” I was so excited when I got Snape. Emma Watson (Hermione Granger): When I stepped into the audition room, I wheeled in a TV that was playing MTV Unplugged In New York and pointed at Kurt Cobain and said, “I want a part that requires this hair.” They immediately gave me Hermione, who has long hair like Kurt Cobain. I was ecstatic. Daniel Radcliffe (Harry Potter): Right when I went into the audition, I insisted on being given a part that had the long hair of Kurt Cobain. They said no, and I got stuck with Harry. Harry’s hair is shorter. I mean, it’s barely the length of Gavin Rossdale’s. Jason Issacs (Lucius Malfoy): The hair my character got would make Kurt Cobain weep with jealousy. Rupert Grint (Ron Weasley) [Ed note: Rupert’s lines are spoken through translator Mark Harsley]: I was shocked when I got the call to be Ron, because I never even auditioned. I suffer from a rare brain condition where if I speak or think in the English language, raw sewage begins pouring from my mouth. I don’t know where it comes from, but it’s unpleasant, so I try to avoid it. Tanya Seghatchian: We gave Rupert the part when we heard there was this kid from Essex whose mouth erupts with raw sewage if you could make him speak in English. We wanted to see this freak for ourselves. J.K. Rowling: Man, it was amazing just how much sewage would pour out of his mouth. We quickly learned that if we could make Rupert shout in English, the raw sewage is from the Bolshevik Revolution. Emma Watson: You can tell that the sewage coming out of his mouth is from the Bolshevik Revolution because he’d sometimes spit out authentic pamphlets that dated from 1917. I actually had them carbon-dated, at great personal cost. Tanya Seghatchian: We were very pleased with our cast, although I will say that D.L. Hughley had a great audition for Ron Weasley, and we had a few late nights debating that part. David Heyman: The movies got off to a slow start financially, as fans of the books were furious that the movie was not about Grondunglin the turtle tricking his family to swim into the fiery mantle of Earth, but we slowly gained their trust through strong writing, top-flight acting, and by paying America’s Funniest Home Videos to run Chamber Of Secrets in its entirety on one of its episodes. Soon, Harry Potter was a hit. J.K. Rowling: I remember being very surprised every time I came to the set and saw that no one was dressed up as a turtle convincing his entire family to commit suicide. With the movies a critical and box-office smash, the world watched all the stars of the series very closely. As Harry, Ron, and Hermione grew up on screen, their real-world counterparts grew up under the intense eye of the news media and throngs of adoring fans. Rupert Grint: After Chamber Of Secrets, we all became indescribably famous. Our faces were everywhere. Fans would even dress up as our characters for movie premieres. Emma Watson: We got very nervous when people dressed up like us because we thought they were trying to steal our parts. Rupert Grint: Even though it was explained to us numerous times, we never lost that unease over seeing fans dress up as our characters. We wanted to keep our parts. Our parts had made us famous. Daniel Radcliffe: After that second film, I got cast in this commercial for Deceased Cactus Gum. Obviously, I was beyond excited. Alfonso Cuarón (director, Prisoner Of Azkaban): When the first day of shooting for Prisoner Of Azkaban rolled around, we were all wondering where Daniel was, and then someone told me he was shooting a commercial for Deceased Cactus Gum that had gone long. J.K. Rowling: We were worried, but then this kid who looks exactly like Daniel shows up knowing all of his lines and the names of every dead pet that every member of the cast and crew ever had. Tanya Seghatchian: We knew it wasn’t Daniel because this other guy, who refused to give us his name, was much larger, and kept saying, “There’s no more coffee” after takes, which would make us all really nervous. Emma Watson: We would all run back to the craft services table and be very relieved when there was still coffee. During the scene where Remus Lupin turns into a werewolf, the reason we ran away when the werewolf attacks us is because right at that second, the impostor shouted there was no coffee left, but they edited that audio out. Alfonso Cuarón: I’m kind of glad the large boy without a name said that, because I couldn’t get up the nerve to ask any of the actors to run away when the werewolf attacked them. I knew the actors were brave, so it was against their instincts. Rupert Grint: I would rapidly drink cups of coffee every time he tricked us, as if I would never see coffee again. Coffee gives me the strength to pretend to be someone I’m not. All actors need coffee. Emma Watson: Daniel wasn’t able to be on set at all for the filming of the third through sixth films because he just couldn’t nail the Deceased Cactus gum commercial. They said he was done after the fourth take, but he’s a pro and wanted to get it right. Daniel Radcliffe: I was completely blindsided when I walked back on set for Deathly Hallows and saw some other guy there being Harry Potter. I was enraged. David Yates (director, Deathly Hallows): But we had a bigger problem: We were trying to figure out how to shoot the scene where six characters take Polyjuice Potion and all transform into Harry Potter. There isn’t a computer in the world strong enough to do it. Tanya Seghatchian: But luckily, the large impostor said that he would leave as quickly as he came if only we would allow his five identical brothers a chance to be on camera. Daniel Radcliffe: This was quite the windfall for us, and I warmed to my doppelganger. I consider him one of my closest friends, though I have not seen him since that day. Emma Watson: He said one last “There’s no more coffee” right before he and his five brothers left the set, but he did it in a funny, wry way, like he was just doing it for laughs. Rupert Grint: We all laughed, but we still rushed to craft services just in case, to drink more of the coffee that allows us to act so well. Robert Pattinson (Cedric Diggory): The producers were pretty straightforward with me that the only reason they cast me was to boost ticket sales, as they knew all 160,000 people in my immediate family would go see it. Ralph Fiennes (Voldemort): I was tickled to be in these movies, especially because I didn’t have to do anything. Through digital editing technology, the producers were able to use a composite of my performance in Maid In Manhattan as Voldemort. Alan Rickman: When we filmed Snape’s death scene in Deathly Hallows: Part 2, the producers just rolled in a TV that was playing the appropriate scene from Maid In Manhattan. It was the most positive acting experience of my life. It was an honor to die beneath the hair of Cobain. The eight-part film series spanned 10 years and grossed over $7.5 billion. It is one of the most important cultural touchstones for both kids and adults all around the globe. The films continue to captivate the children of today, and their legacy remains strong. 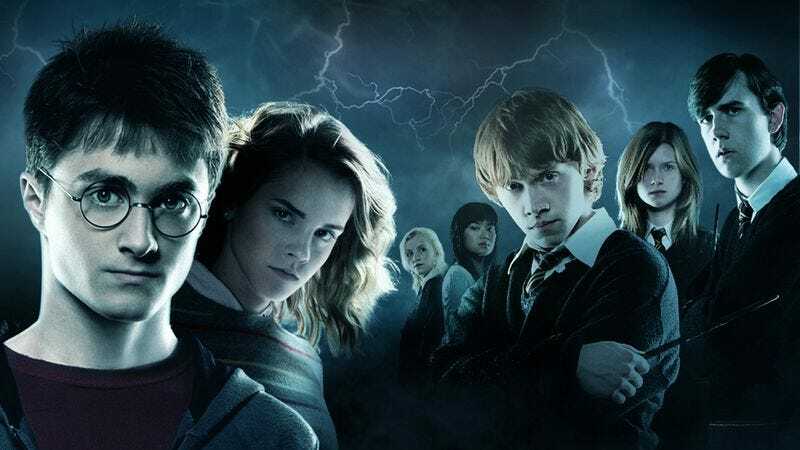 J.K. Rowling: The kids who began watching the series in elementary school grew up along with the characters, and now they’re all stockbrokers. Every person who was transfixed by the films’ magic and wonder all work on Wall Street as high-powered brokers now. I am honored to have been a part of that. Rupert Grint: I want to hang out with my friends, but they always tell me, “Sorry Rupert, we have to make a risky trailing stop limit trade on a nitrates wholesaler and it’s all because we watched you in Harry Potter.” It’s very frustrating. Emma Watson: I wish I were a stockbroker. It seems like a very rewarding career. Tanya Seghatchian: The legacy of Potter has been immense. Over 60 percent of movies released since 2003 have been set in the wizarding school of Hogwarts. It just speaks to the high quality of our work. Alfonso Cuarón: When I see a movie where the director decided to use a camera to film actors talking, I am honored that they got that idea from my Prisoner Of Azkaban. Daniel Radcliffe: My life is so different than it was back in 2001 now that I’m incorrigibly famous. Whenever I go out in public, people shout, “Hey! It’s the guy from the Deceased Cactus commercial!” and take pictures of me. Plus, I get as much Deceased Cactus as I can chew. For free. Emma Watson: I thought Harry Potter would catapult me to any role I wanted, but casting producers all over Hollywood who loved the original Harry Potter book about Grondunglin the Turtle who tricks his family into killing themselves held it against me that I appeared in this “apocryphal” rendition. I’m more or less finished in show business. J.K. Rowling: People keep asking me if I’m out of ideas, or if I’ll ever create something great ever again. I simply say of course, as there are billions of sea creatures on this planet who can convince their entire families to murder themselves, and I can tell those stories. All of them. I refuse to sleep until I accomplish this goal, and that’s really what Harry Potter is all about.